The villa offers all modern comforts and facilities, including a spacious living with top Italian design furniture, lighting and customized artwork. The entire villa is equipped with automation as well as with Bose and Sonos audio systems, large flat screen TVs and a heated pool. Home automation is defined as the integration of technology in the home environment, for the benefit of a better quality of living and life. There are 4 bedrooms and 4 bathrooms. Every bedroom has an en-suite bathroom and a private terrace. The master bedroom is located on the level of the living. The ground floor of the villa is airconditioned. The other 3 bedrooms are located on a lower level. The master bedroom (box spring bed of 180x200cm) has an open en-suite bathroom with a bath, (rain) shower, sink and toilet. Bedrooms 2, 3 and 4 all have a box spring bed (180x200cm) and an en-suite bathroom (luxury shower, sink and separate toilet). All bedrooms located on this level have a wooden terrace. 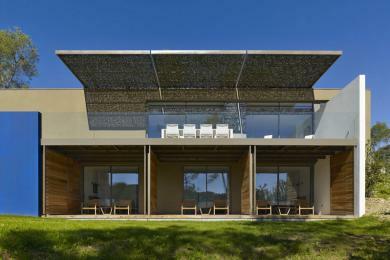 Very special is the way the terrace per bedroom can be protected by wooden panels from the sun. The villa is located in an upscale residential area just outside Montpellier. The villa offers good views over lush forest area and offers 100% peace and quiet. The villa is located in a beautiful garden and features three very large terraces so you can absorb the sun at any time of the day. The entire villa offers an atmosphere of unstrained luxury and stylish architecture. In terms of comfort and luxury there is no difference between the interior and the outside. The sitting or relax area outside is practically a extended interior. Through large sliding doors you walk from the kitchen and from the living room directly on the large terrace. The pool is located at the level of the living room and kitchen and master bedroom. The pool is beautifully incorporated into the wooden terrace. On the terrace you find a luxurious lounge set and a large table to enjoy al fresco dining. The villa is conveniently located (only 10 minutes by car) near the bustling center of Montpellier. At 20 minutes by car you find the wide sandy beaches of Maguelone and Sete. Also very interesting is the wine region of the Pic Saint Loup and the Hérault valley and the Cevennen. Sporting activities are abundant; all water sports, golf, hiking, biking, horseback riding and all mountain sports like canyoning and kayaking. The location of the villa allows for day trips to Sete, Narbonne, Carcassonne, Avignon, Nimes, Arles, Aix en Provence and the Languedoc-Roussillon and Provence. Pool: Private Pool size: 10 x 3 m.
Side view with all the doors to the terraces of the bedrooms open!